Woody and the West Side Warblers will be with us at our May dance. Friday, May 3, we welcome a new-to-us contra band, Woody & the West Side Warblers, a foursome conveniently (for us) based in Providence. These are not the insectivorous warblers you may be familiar with, but the distinctly musical kind. Read all about them here and watch them in action here. Tod Wittemore will be the caller. Friday, June 7, for the last dance before our summer break, don’t loaf around, get off your bun, rise to the occasion. You knead to come dance to the music of Julie, Mickey, and Robert, aka Wry Bred. More about this fabulous trio here. The caller will be Don Veino. July, no dance as we break for the summer months. HCD Quiet Corner Contra dances are held on the first Friday of each month (except no dances in July and August) at the Patriots Park Lodge, Coventry, from 8:00–11:00 p.m., with a free workshop for beginners from 7:45–8:00. We have a live band at all our dances, and each dance is taught and prompted by a caller. Our dances are smoke-, alcohol-, and fragrance-free. 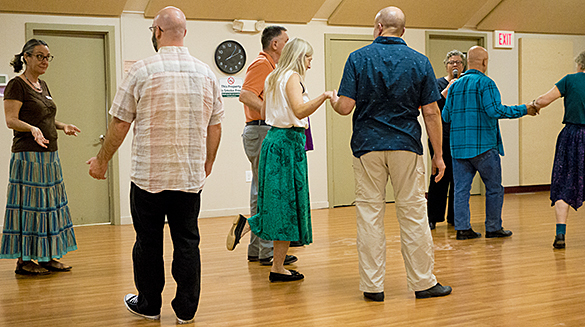 Find our more about contra dancing in general here, and read about our other monthly contra dance, the HCD 2nd-Saturday Contra dance here. The regular adult admission for our monthly contra dances is $12. Students (with ID, please) are asked to pay $6, and children 12 and under are admitted free of charge. There is no additional charge for the home-made refreshments we provide, nor is there an extra fee for enjoying the awesome view of Coventry Lake. If our admission charges represent a hardship for you, please let us know. We are willing to work with you. No extra charge for the yummy snacks at our dances, and we invite you to bring home-made goodies to add to the refreshment table. View a printable schedule of upcoming HCD Quiet Corner Contra dances here. View a video of a recent HCD Quiet Corner Contra dance here. and all other HCD events here. The committee that puts together HCD Quiet Corner Contra dances consists of, from left to right, Dennis, Joyce, Ruth, and David. If you’d like to get in touch with them concerning HCD Quiet Corner Contra dances, complete the form below.